A great sense of excitement surrounded the opening ceremonies of the 2018 PyeongChang Winter Olympics with a united north and south Korean delegation participating under the Unification Flag. The stage was set a month before the games began, at the inter-Korean talks on January 9 to promote national reconciliation and reunification and solve all problems between themselves through bilateral dialogue and negotiations, and to dissipate mounting tensions due to U.S. threats to disrupt the Olympics with fire and fury. 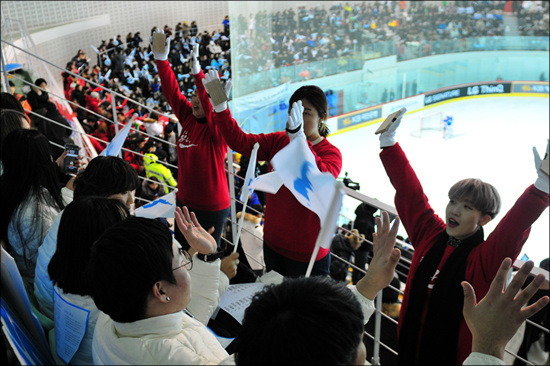 Representatives of the Democratic People’s Republic of Korea (DPRK) and the Republic of Korea (ROK) took the decision to “proactively cooperate in ensuring that the 23rd Winter Olympics and Paralympics in the south side area will be successfully held, providing an occasion for enhancing the prestige of the [Korean] nation,” ultimately resulting in a large DPRK delegation being sent to the games and the two Koreas marching as one in the opening ceremony, among other initiatives. Both sides have gone all out to realize this decision, contributing greatly to reducing tensions created by the U.S. imperialists, Canada and others who are meddling in the relations between the DPRK and ROK. 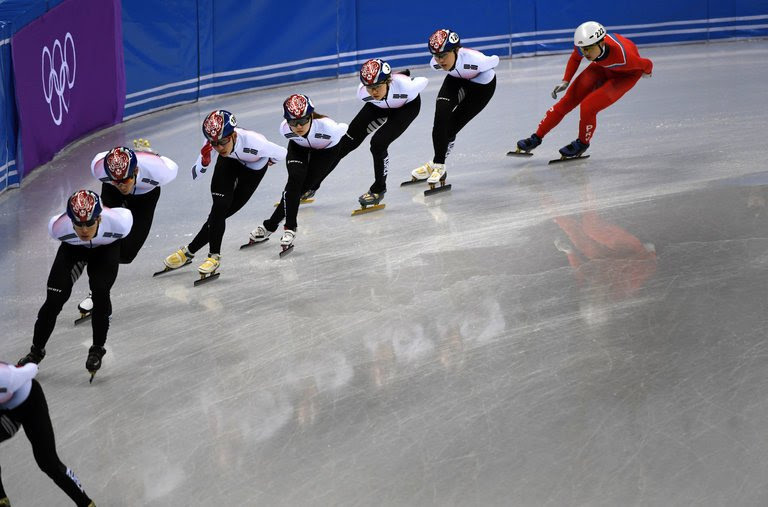 These PyeongChang Games are the 23rd Winter Olympics and feature 102 events in 15 sports, with the participation of nearly 3,000 athletes from 92 countries and territories. It is the first Winter Olympics held in the Republic of Korea and its second Olympics overall, the first being the 1988 Summer Olympics in Seoul. The opening ceremony took place at the PyeongChang Olympic Stadium on the evening of February 9, with 35,000 people in attendance. 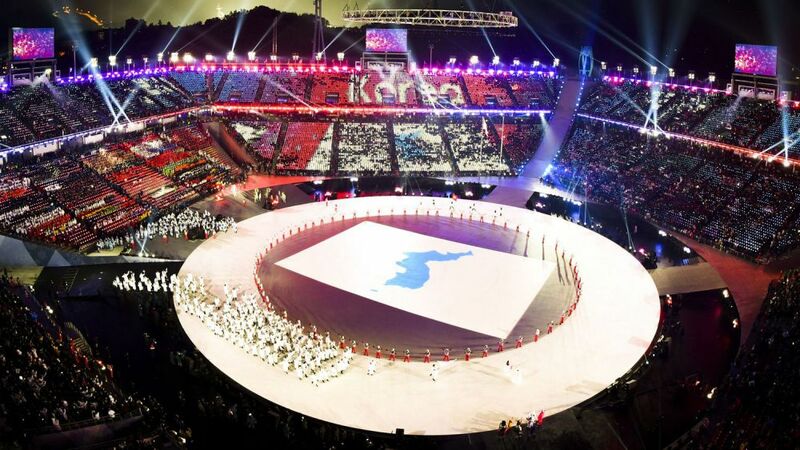 The joint presence of the athletes and leadership from the ROK and DPRK was the highlight of the opening ceremony, while the performances on stage recounted Korean mythology, history and culture, and focused on the themes of peace and harmony, with brilliance and technological prowess. Performers dressed in traditional costume danced for the thousands of spectators attending the opening ceremony. The sincere aspirations of the Korean people to unite their divided nation made short shrift of the views repeated ad nauseam by the imperialist press that the united presence of the ROK and DPRK athletes was a short-lived “manipulation” or “charm offensive” by the DPRK. 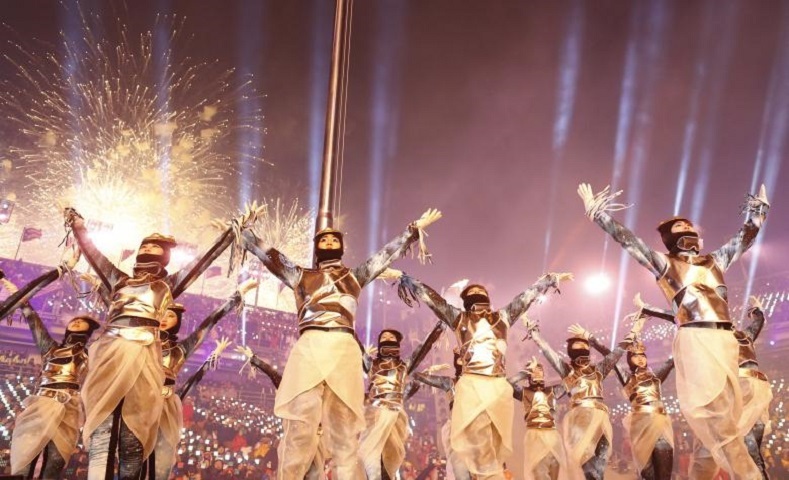 Highlights included the Parade of Nations, with Greece leading the way as the historic founding nation of the Olympics, followed by all the other countries in alphabetical order according to the Korean language. 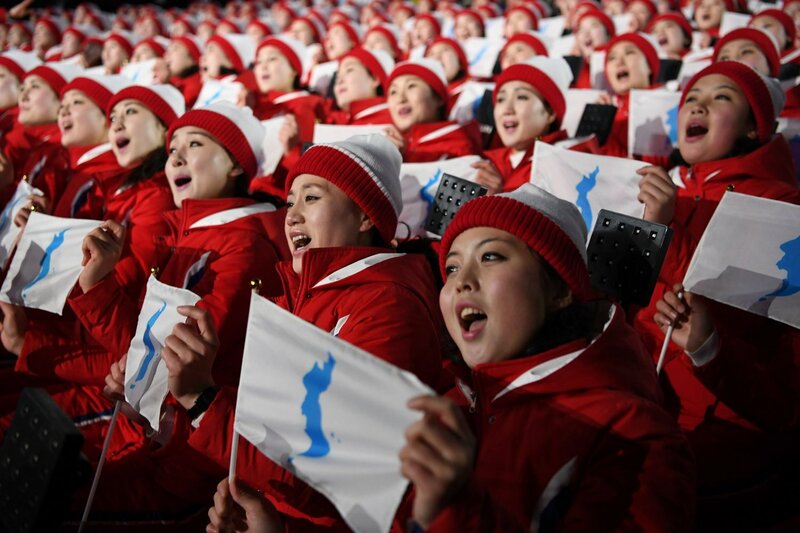 The parade concluded with the 180 athletes from the DPRK and ROK marching as one behind the Unification Flag, to the accompaniment of the Korean folk song Arirang, the anthem of reunification in both north and south. They received a standing ovation. Above, photo shows joint Korean delegation entering PyeongChang Olympic Stadium at the opening ceremony, February 9, 2018, ending the parade of nations. 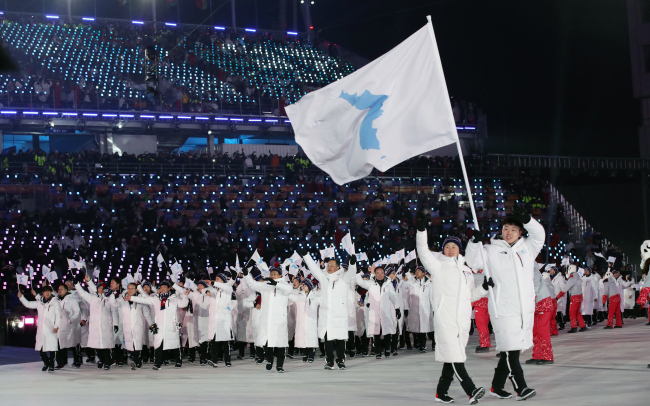 The Korean Unification Flag takes centre stage and flashes across the stadium seats with the name “Korea.” The Korean delegation was led by flag bearers Hwang Chung Guam of the DPRK, a member of the unified Korean women’s hockey team, and ROK bobsledder Won Yun-jong. President of the ROK Moon Jae-in (front left); First Lady Kim Jung-sook (front right); Kim Yong Nam, President of the Presidium of the Supreme People’s Assembly of the DPRK (back left); and Kim Yo Jong, First Vice Director of the DPRK’s Workers’ Party Central Committee and head of the DPRK’s delegation to the Olympics (back right). The visit to the ROK by such a high-level delegation from the DPRK is the first since the armistice that ended the Korean War in 1953. “A great example of this unifying power [of the Olympics] is the joint march here tonight of the two teams from the National Olympic Committees of the Republic of Korea and the Democratic People’s Republic of Korea. We thank you. “All the athletes around me, all the spectators here in the stadium, and all Olympic fans watching around the world, we are all touched by this wonderful gesture. We all join and support you in your message of peace. “United in our diversity, we are stronger than all the forces that want to divide us. ROK President Moon Jae-in then officially opened the games. 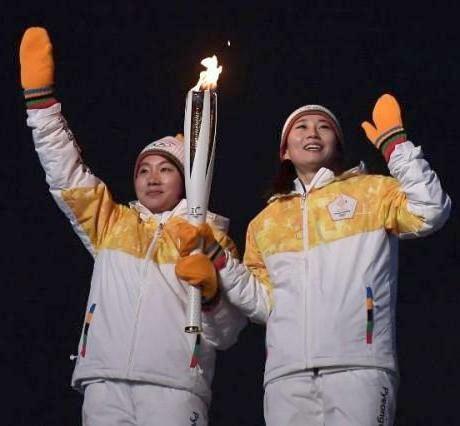 Two members of the united Korean women’s hockey team, Park Jong-ah of the ROK and Jong Su Hyon of the DPRK, had the honour of jointly carrying the Olympic torch up a majestic flight of stairs before handing it over to the heroine of Korean sport, Olympic medalist and world champion figure skater Kim Yuna from the ROK, who lit the Olympic cauldron. women’s hockey game, February 10, 2018. 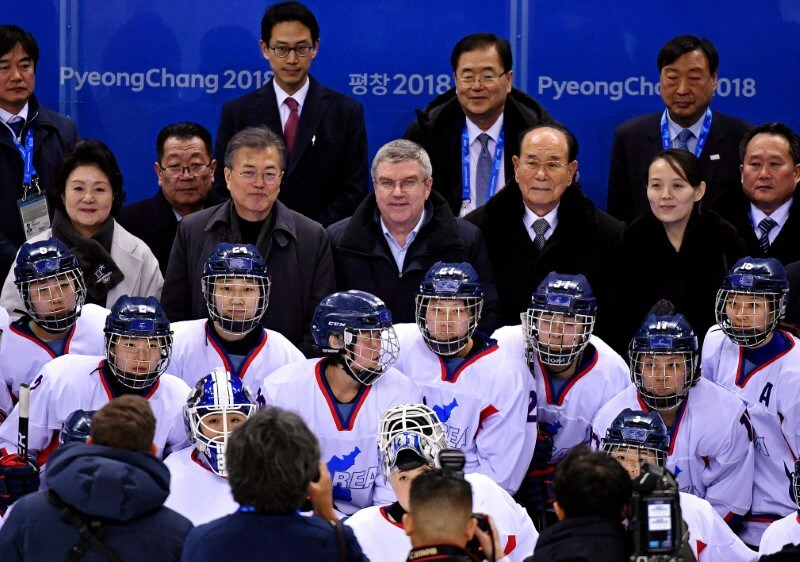 For the first time in 65 years, south and north Korean athletes are playing in a unified Olympic team, the women’s ice hockey team. The 35-member squad includes 15 players from the DPRK. The players from the ROK include players who hold dual Korean-Canadian and Korean-U.S. citizenship. The unified team is coached by Canadian Sarah Murray. The players from north and south were brought together only 10 days before their first scheduled game. 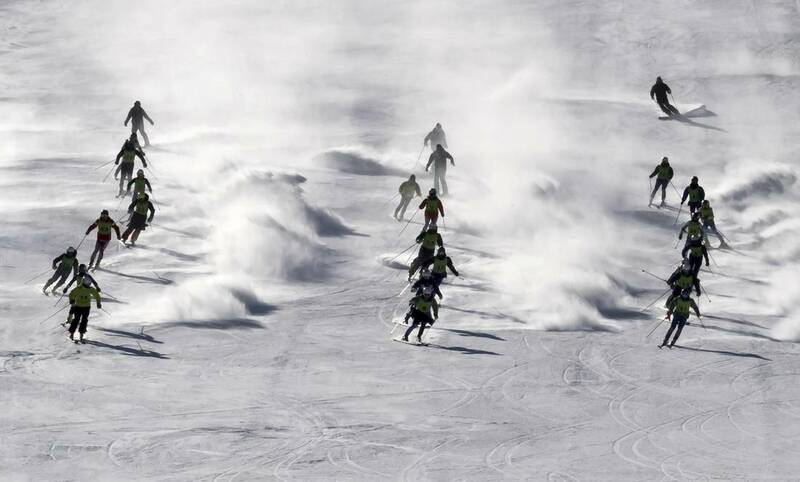 Skiers participate in a joint training session at the Masik Pass Resort in the DPRK on February 2. 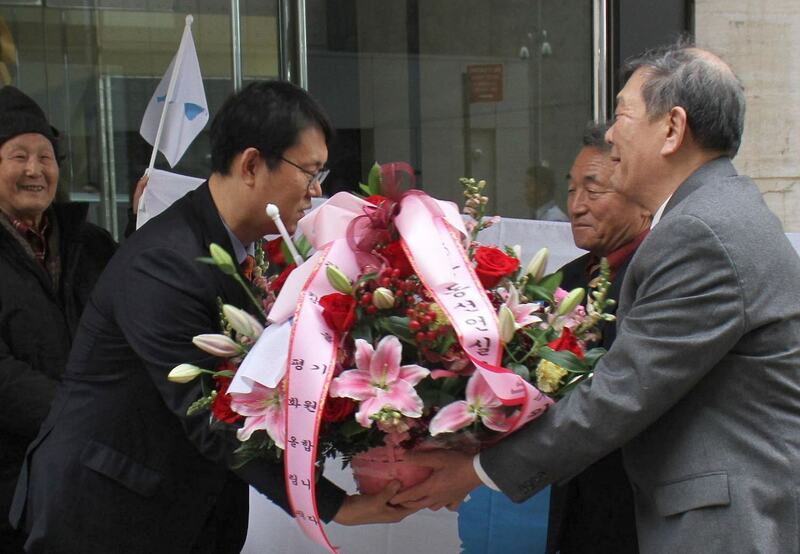 Two hundred and eighty members of the DPRK delegation arrived in south Korea on February 7. 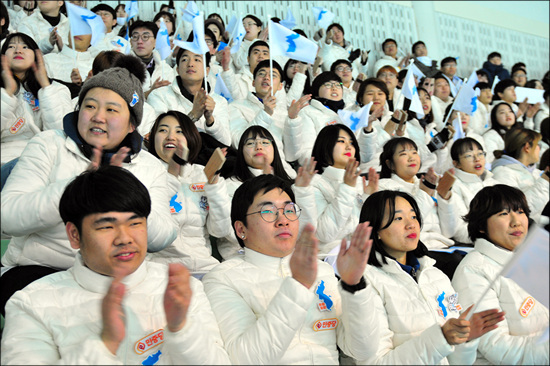 The contingent included Minister of Physical Culture and Sports Kim Il-guk and three other members of the DPRK’s National Olympic Committee, 229 cheerleaders, 26 members of a taekwondo demonstration team and 21 reporters. The Moranbong Band and Samjiyon Art Troupe perform in Gangneung, February 8, 2018. 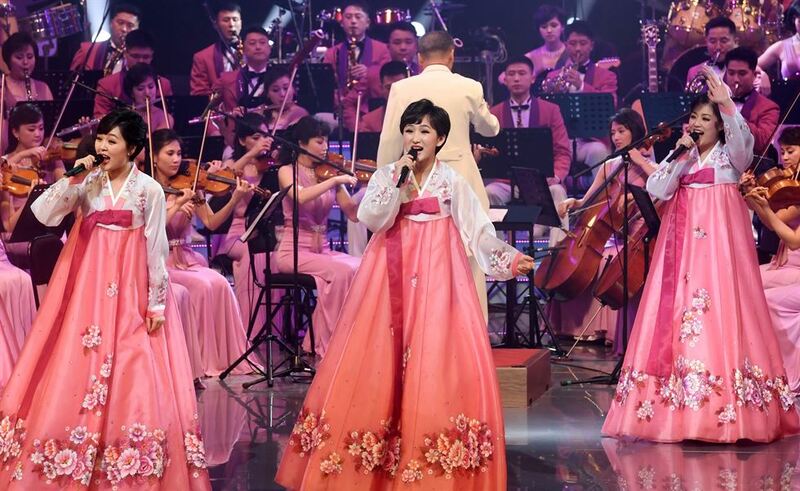 The DPRK’s Moranbong Band and Samjiyon Art Troupe comprised of 140 performers arrived February 6 by ship, under an exemption from the sanctions regime. On February 8, they held a performance at the 998-seat Saimdang Hall of the Gangneung Arts Centre. The south Korean government invited members of families divided by the Korean War and the socially disadvantaged to attend, while 560 seats were reserved for ordinary citizens chosen by lottery. Some 150,000 people are said to have applied online for those seats. 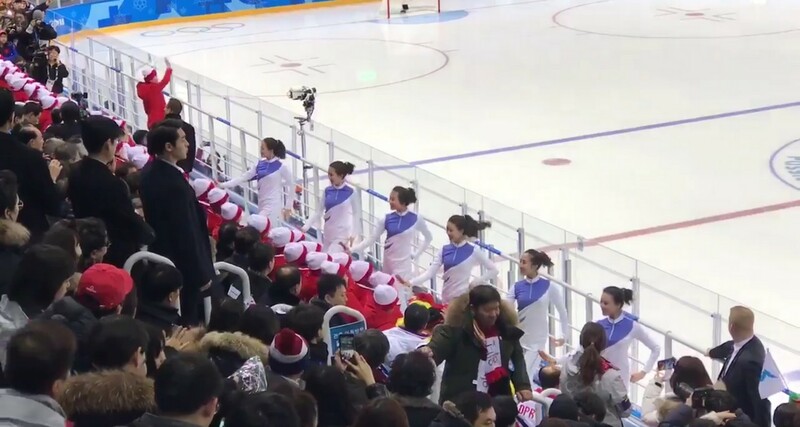 “The first time that a North Korean cheerleading squad visited South Korea was the 2002 Asian Games in Busan. From the moment they arrived in Busan’s Dadaepo Harbor on the Mangyongbong 92 ship on Sept. 28, before the games’ opening ceremony, they were the talk of the town. 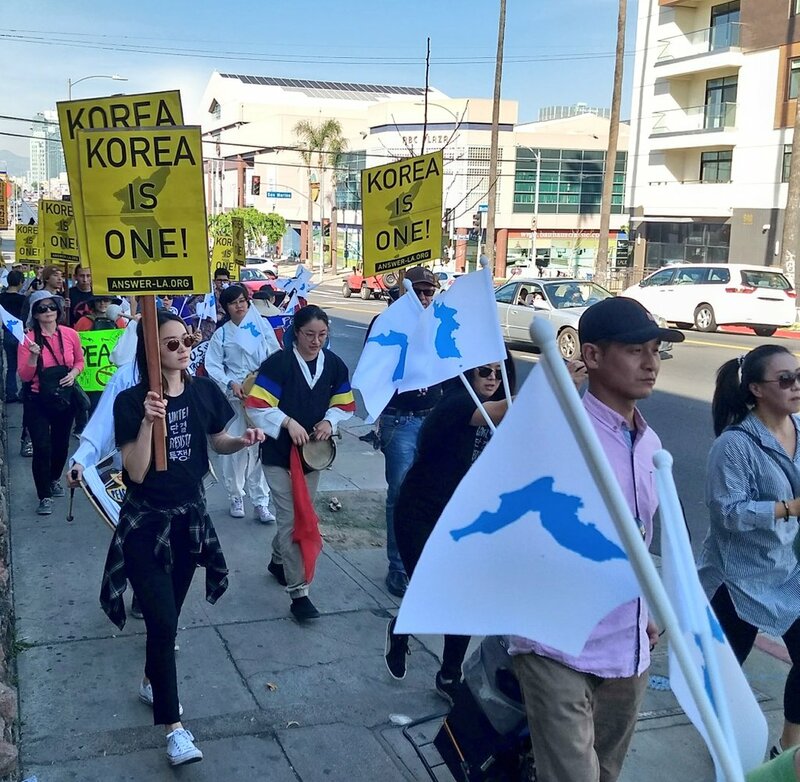 More than 2,000 South Korean well-wishers had gathered at the harbor and welcomed them under the Unification Flag, while more than 280 North Korean cheerleaders, wearing variously colored hanbok (traditional Korean attire), smiled broadly and waved at them. 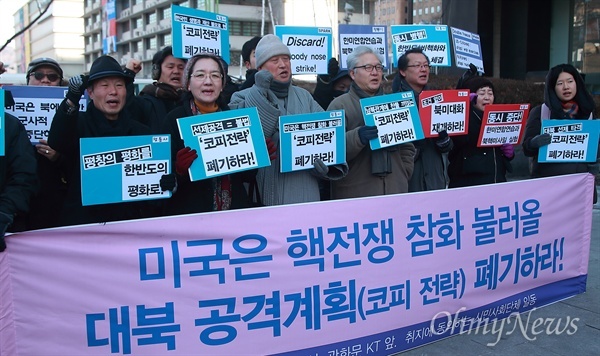 On February 8, a 100-person delegation from the General Association of Korean Residents in Japan (Chongryon) arrived in south Korea to take part in the PyeongChang Olympics. 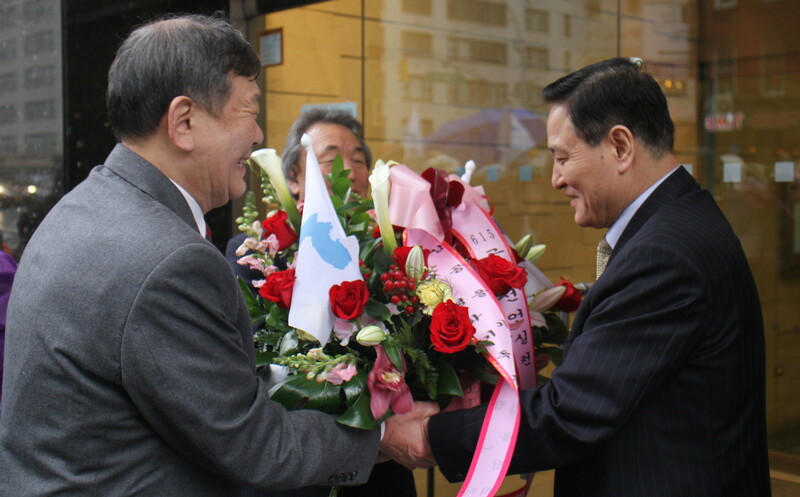 The Hankyoreh informs that this is the first time in 16 years that Chongryon has sent such a delegation to south Korea. Besides the overseas Koreans arriving from Japan, many others living in the U.S., Canada and Europe arrived February 8 and 9. In Seoul on February 5, activists with Solidarity for Peace and Reunification of Korea (SPARK), held a picket and press conference in front of the U.S. Embassy. 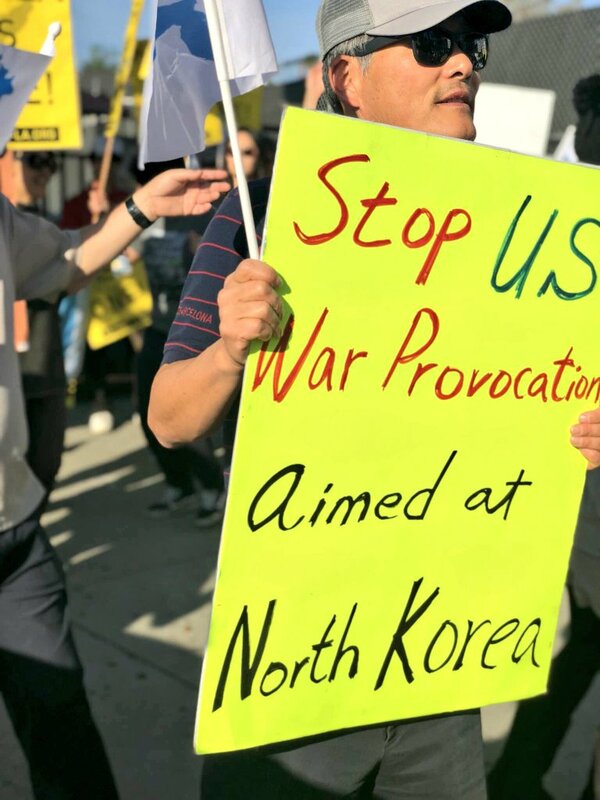 They specifically denounced the U.S. plans for a “bloody nose” pre-emptive military strike on the DPRK, saying that this would only exacerbate the situation and lead to an all-out war. They reiterated that dialogue and negotiations are the only means to resolve tensions and the nuclear issue on the Korean Peninsula, and urged the U.S. to engage in dialogue with the DPRK. 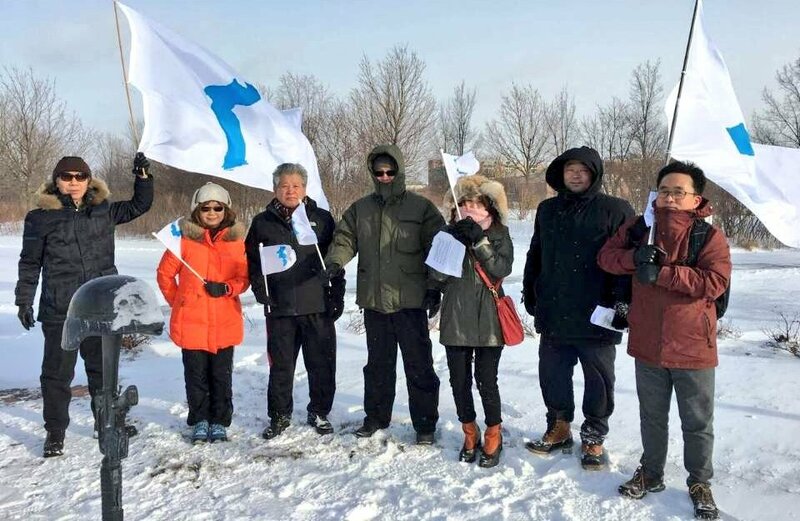 Later on February 9, the CBC used a small staged anti-DPRK action outside the opening ceremonies as an excuse to promote the U.S. imperialists’ virulent aim to attack the DPRK and undermine Korean reunification. 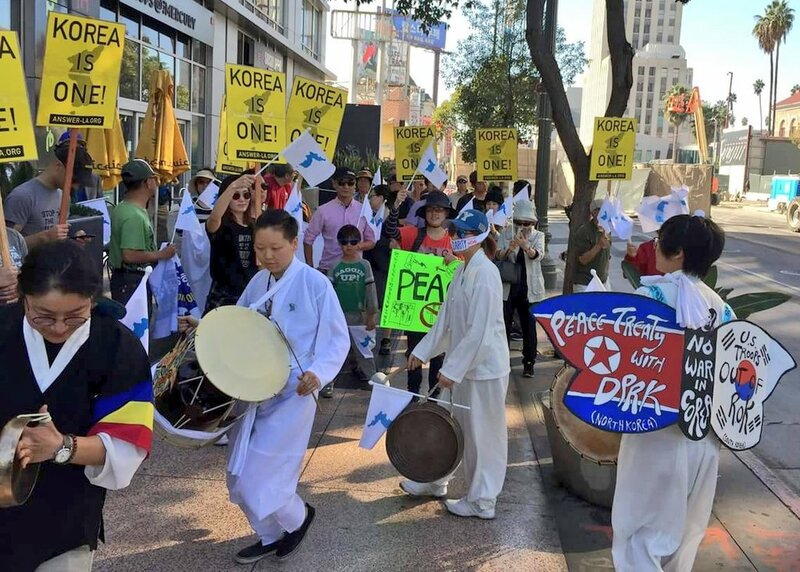 In New York, the peace march began in front of the Permanent Mission of the ROK to the UN, where the committee delivered a bouquet of flowers to a representative of the mission. The crowd then proceeded to the Permanent Mission of the DPRK to the UN, where they were received by Ja Song-nam, the DPRK’s Ambassador to the UN. He expressed his gratitude and hope that the PyeongChang Olympics will contribute to “improving relations between north and south Korea towards reunification.” Ja joined the peace marchers in singing Arirang. Marchers gather at a war memorial in Gallery Park, Chicago. 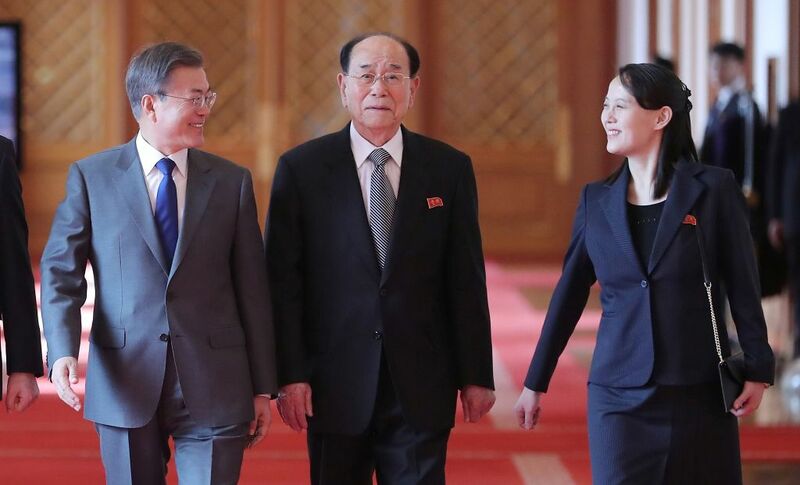 President Moon, Kim Yong Nam and Kim Yo Jong head to a luncheon meeting at the Presidential Blue House in Seoul, February 10, 2018. The last such summit took place October 2, 2007, between then-ROK President Roh Moo-hyun and the late DPRK leader Kim Jong Il. 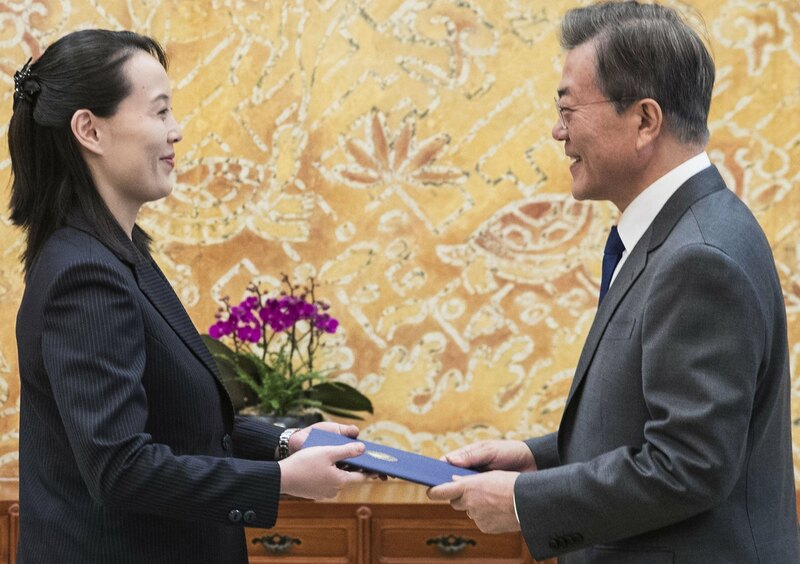 “An early resumption of dialogue between the United States and the north is needed also for the development of the south-north Korean relationship,” President Moon added, a spokesman said. 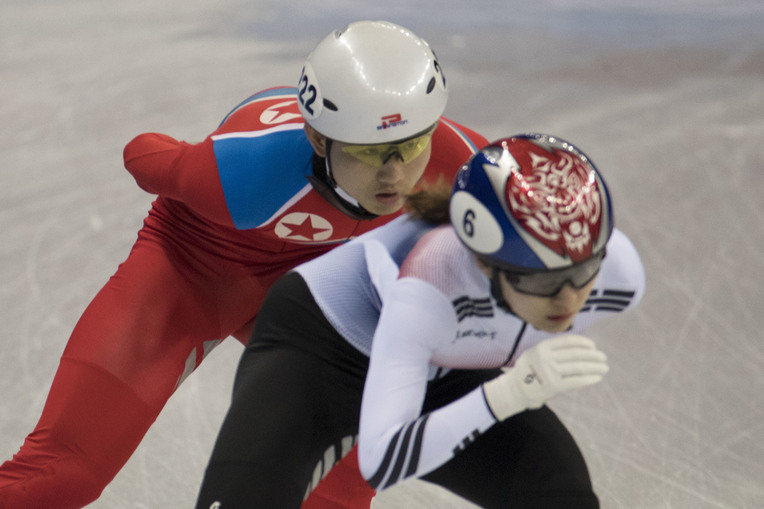 A spontaneous joint practice of north and south Korean speed skaters takes place at Gangneung Ice Arena, February 8, 2018. Meanwhile, the U.S. appears nonplussed by the dialogue between the DPRK and ROK. News media have commented that U.S. Vice President Mike Pence, head of his country’s Olympic delegation, has been assiduously avoiding contact with members of the DPRK delegation. In that vein, he left an Olympic dinner hosted by President Moon on February 8 shortly after arriving, where he was to have shared a table with Kim Yong Nam. 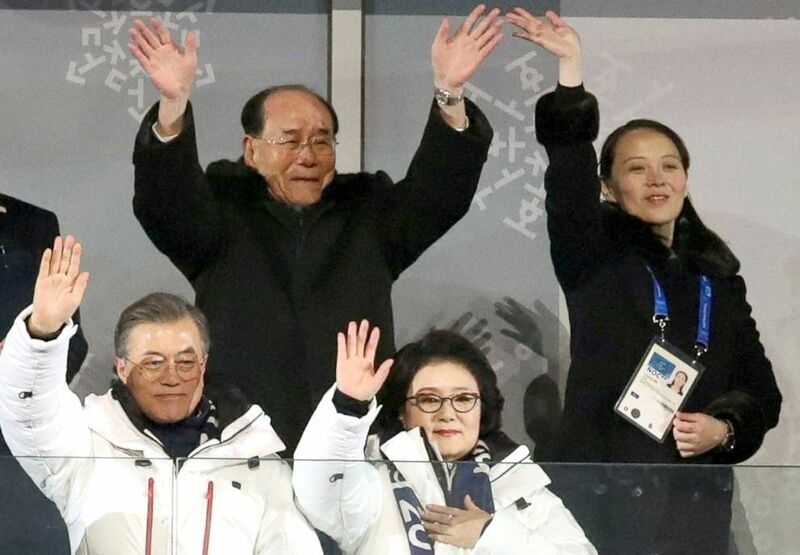 On February 9, he refused to acknowledge the presence of Kim Yong Nam and Kim Yo Jong at the opening ceremonies, though seated practically in front of them. While the entire stadium was seen to give a standing ovation to the joint Korean delegation as it marched through the stadium behind the Unification Flag, Pence pointedly remained seated. And the story is. . .?